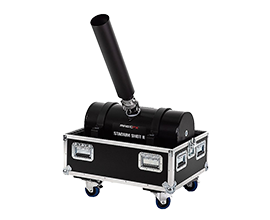 As the largest confetti cannon available, the Stadium Shots give an unrivalled hit of confetti or streamers and as the name implies are designed for use in the largest of venues, Arenas and Stadiums. For the same effect in a smaller venue we also have the stage shots perfect for leaving on stage where you dont want a huge bit of kit. Max Distance - Confetti: 20m Streamers: 35m Stadium Streamers: 40m!